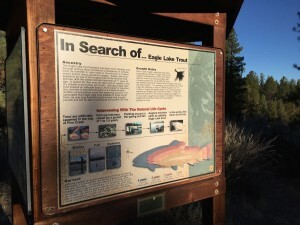 On October 8, 2014, I made my way to Eagle Lake (in Lassen County) in search of the unique rainbow trout that lives there. I drove all around the lake hoping to find a good spot to park my car and fish from the shore… tried a few spots with no luck. But the drive around the lake was enjoyable enough, though it was unfortunate to see the lake half empty due to drought conditions. Wish shore fishing not panning out I made my way to the marina store to get some advice. I walked around the shore to where other anglers were wading. 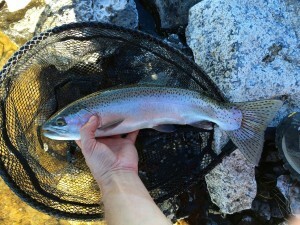 It was clear that in order to get my fly into deeper water I had to wade out as far as I could. I saw a bunch of trout swim by but I wasn’t able to prompt a strike. After a few hours of wading I headed back to the shop, bought some worms, and headed to another recommended spot. Within 15 minutes I had a healthy 2-3 pound Eagle Lake rainbow on my line. It would have been delicious, but this trip was all catch and release so back into the lake it went.